I’d like to share one of my fermented fridge basics with you. At ALL times I have a jar of each of these to hand. A BIG jar! They’re so ready to add to recipes. It’s said that the best way to get plenty of probiotics into your system is to make a variety of fermented food and drink so that you’re always adding a little to recipes whenever you can. It’s safe to say that the fridge is usually full of fermented food at any one time, but I’m rarely without the foods above! If you read about fermentation, it’s often quoted that it’s necessary to use 2-3% salt for wild ferments. I met with a leading fermenter and author on the subject who uses 2% in his sauerkraut and says that you can adjust the level of salt to suit the ferment. Salt prevents the process of fermentation running away to quickly and stops the food breaking down too quickly, but many people don’t want to use too much salt and also, if the food is very salty, it can be hard to add it to dishes. With preserved lemons and limes, the outer skin is tough and I’ve found a formula that works very well, the fruit definitely ferments nicely and keeps in the fridge for a long time successfully. We keep our fridge at 2 degrees. Remember that food continues to ferment in the fridge, just at a slower pace. The hotter the environment, the speedier the fermenting process. The cooler, the slower. The surface of limes strips to the same colour as lemons when fermented, so mark your jars or you may not be able to tell them apart! 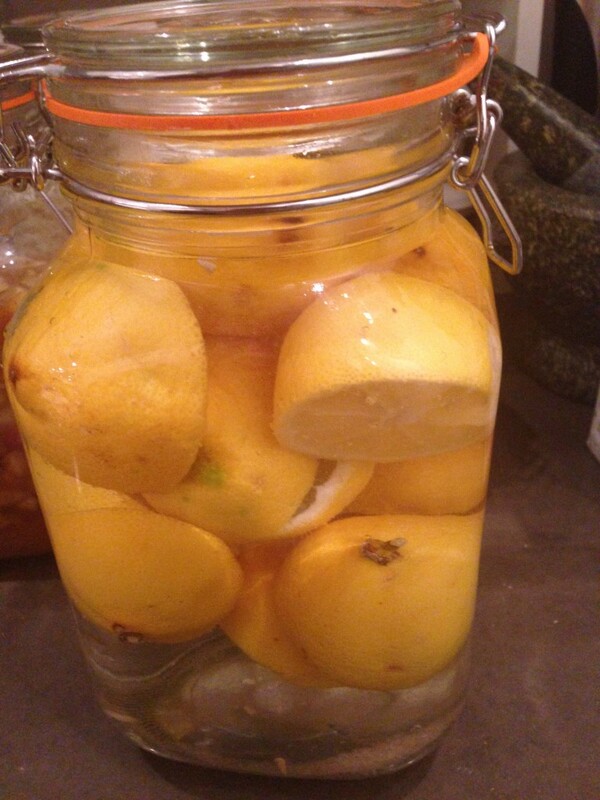 Enough lemons or limes to fill a 1 1/2 quart/litre clamp down jar. Pop the fruit into your jar and fill it to just below the neck of the jar. Fill the jar with filtered water to above the level of the fruit. Clamp down the jar and leave in a room at around 68 – 75 degrees Fahrenheit until you can open the jar and it makes a popping sound or you see tiny bubbles forming in the water. Taste the water. Taste a little of the lemon/lime. You will notice that it becomes fizzy and more sour than usual. Keep a close eye on your ferment if the room is warmer than the temps above. We don’t keep our rooms at an even temp all the time, so times will vary when ferments are ready. Please always use any suggestions as a guide. And it takes seconds to make them! Go on. Make some this week and start adding a little fermented juice to your food and drinks right now! What a great idea. I had never heard of this but will be trying it out. So pleased to find your blog – it’s good to link up with healthy eaters. I have been into this way of life since meeting someone like you while living in Canada many years ago and understanding how ‘normal’ food causes terrible health problems but it is SO hard to live that way while surrounded by ‘normal’ eaters. Got a jar full ready to be pickled now. I’ll be adding pepper corns, red chilli peppers and some jaggery to it. What a great idea Corinne! That’s the great thing about fermenting food. You can add whatever suits your palate or whatever dishes you’re making!